In business aviation, jet fuel is the highest variable cost of jet ownership. Professional pilots must calculate the optimized flying speed and altitude, based on a variety of factors, to determine what is both the safest and most efficient fuel burn. Technology exists— for many commercial jetliner pilots— to quickly calculate the amount of fuel burn in pounds per nautical mile, but do corporate pilots utilize similar tools in the private aviation sector? As an aircraft owner, how do you know if your pilot is flying fuel efficiently? When Cliff mentions the idea of, “tankering fuel,” he is referencing the choice to carry more fuel than needed for a particular flight. “By tankering fuel, that could mean fueling more at one location to save on high fuel prices at another— and then so-on to optimize buying fuel at lower cost locations,” says Cliff. For the corporate pilot, discovering an efficient fuel burn doesn’t end after checking a website or app, but he or she must also use good judgment to achieve the desired fuel burn rate. Private jet pilots have a responsibility to create cost savings for owners; with safety always remaining the first priority. A Clay Lacy pilot— whether utilizing an app-based system, flight computer influenced, or combination method of relying on multiple math formulas— is continually working to keep variable fuel costs optimized and achieve a fuel efficient flight. Our experienced FBO team is focused on delivering personalized service. 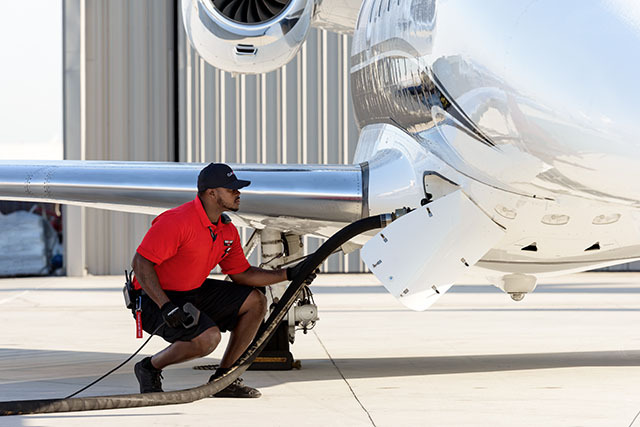 Learn more about our FBO services and competitive fuel pricing.